Drum Forum - Drummers Forum > Drum Forums > Drum Forum - HardWare - Talk Drum Hardware (Forum Moderators: PASHA, KenSanders) > Do you think Resonant mounts work? Question: Do you think resonant mounts work? Do you think Resonant mounts work? I happen to be doing a little project for my further education, and i wanted the project to be on drums. After talking to some people and doing some stuff, my project involves resonant mounts. For those who arnt sure what im talking about, im talking about the things that have, in the last few years, been appearing as standared items on drum sets. They offer an alternative to holding a drum by simply bolting the hardware directly on the shell of the drum, and they hold the drum by a method that involves touching as little of the drum/drum shell as possible. The theory behind them is pretty simple; to isolate the vibrations. When a drum is hit, the shell and heads vibrate. so by having as little touching the shell as possible, it lets the shell vibrate more, thus improving the sound. Also, it is supposed to stop the harware vibrating, which the sound might get picked up on mics while recording. So, in your own opinion (from acctully hearing the difference, or beliving the words of companies/teachers/other drummers) do they make a difference to the sound of a drum? Please dont be swayed into changing your answer because of an opinion posted in this topic. Re: Do you think Resonant mounts work? I love the theory but I personally think that ethier ways is good. I don't think it has a big different in sound. I look at my bass drum it has 3 things on it. 2 toms and a splash. i get a great sound out of it all. I believe that you can set up your drums wrong and it will have vibrations. at first when i got my splash and added to my set and when i hit the bass it would make the splash vibrate (spelling?). i set the splash at a different angle and hit the bass and no vibrations. If my post is off subject, I'm sorry. Nah, you're fine lol, good points. You do have the access to his email via this forum correct? This is quite an old topic by now, but since I just joined I thought I might my opinion. I've had drum kits with and without the "rims mounts" as I call them. In my opinion they allow more of the fundamental pitch to come out of the drum. There are situations where that is good or great ... and there are situations where too much resonance will drive you crazy. I currently own a Premier Artist Birch set with 10", 12" and 14" toms on rims mounts. When I use a relatively open tuning, the resonance has sometimes been too much for recording and I've had to put moon gel on the toms. That said, I suppose I'd rather have too much tone and have to take some away rather than trying to get something out of a drum that is barely there. And of course, all the vintage drums that so many of us know and love do not have rim mounts and they sound great! Even more so that you own a Premier. The resonant mounts on this kit are called "ISO mounts" and you're right, you have to take the tom off the kit to change heads. The ISO mount is simply fastened to four of the lugs. Since my standard procedure for drum tuning is to take the drum off the kit and place it on the throne or on the floor, this doesn't bug me. But is there a resonant mounting system that doesn't require you to take the drum off? BTW: one of my peeves with my Premier kit is that the floor tom on mine (different from the pic above) is also on an ISO mount. For my money, a "real" 14" or 16" floor tom with three legs sounds better than an ISO-mounted 14" or 16" tom. It may be purely psychological on my part, but I like my floor tom to be totally stable and I hate having to attach it to the ride cymbal stand. Everything just gets wobbly and you have to position the ride together with the floor tom, yuck. Thats interesting, thanks. And yes, some drum manufacturer's mounts do attach directly to the lugs. Sonor, DW, yamaha to name a few (well...yamaha's mount still fixes to the shell, but on its "nodal" points). Yea, i can understand the lower tom thing. So a wobbly tom anoys you? I believe they DO WORK. However, the degree of enhancement ithese mounts provide may vary according to the specific drum they are used on. I believe it would help a drum that was somehow "deadened" by the installation on a shell mount, MUCH MUCH MORE than a drum that had a shell mount and but sounded great anyway. The truest test (to me at least) would be to record some different drums, equipped with and without the resonant mounts. Then play it back and see if there is any noticeable sustain or resonance difference to the ears of listeners. In a blindfold test can you tell the difference? You might also remember that some drums are SO RESONANT that they are dampened (this happens in both live and studio situations). Before this style of mount even existed there were drums that had to be dampened somewhat. Also, we've seen drummers who alsolutely want resonant mounts on their RACK TOMS, but who don't see a need for them on their floor toms, opting for traditional shell mounted legs. DW TOM MOUNTS -- GREAT SUSTAIN, BUT TOO BOUNCY!!! I MISS SOLID EXPORT MOUNTS! 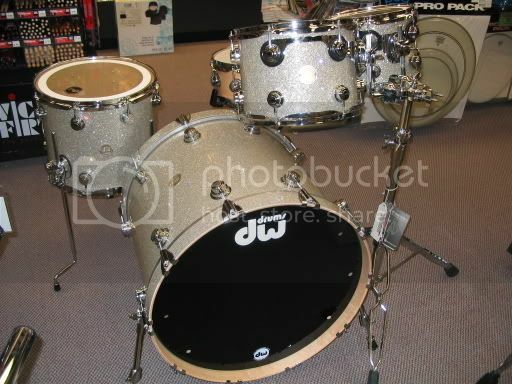 I have a DW collectors kit, very thin maple shells on rubber isolation mounts. These things ring forever! These drums ring WAY more than my old Yamaha Maple Customs (very thick maple drums with YESS mount), which is probably due to the fact that the Yamahas were thicker and the small bolts mount actually bolts right into the drum at two small 'nodal' points. ANY SUGGESTIONS FOR STOPPING THE DW TOMS FROM BOUNCING/MOVING SO MUCH? I play very busy with hands (lots of notes on any given tom), and as a result, I honestly find that I can play an old Pearl Export that has the mount going into the drum shell, MUCH better than I can my pretty DW kit. The Export toms don't move, and your stick can bounce back to you for the next hit! The DW's bounce so much that, at a loud concert, playing them hard wears me out, like playing on pillows. I've gone to great lengths to reduce tom bounce: I've drilled a pearl export double tom holder into the top of my bass drum and i drop the Gibraltar (DW compatible) tom holders into them. I am almost ready to drill my toms for Yamaha or Pearl old-school mounts that go through the shell, if only to stop them from moving so damn much. I refuse to get a rack setup (not the look i'm going for) and i refuse to put my toms in snare stands (kills sensitivity and resonant head vibration). The "bounce" you are experiencing is being caused by the RIMS mounts, not the actual tom tom holder. Without the RIMS mounts, the tom toms should not move any differently than other mounting systems that are attached directly to the drum shell. Therefore, I believe the solution to the "bounce" problem could be very simple. Remove the DW RIMS mounts. Remove the DW brackets from the RIMS mounts. Then install the DW brackets directly onto the shell of each tom. Now the Pearl Export tom tom arms that I have seen, actually penetrate into the drum shell. Some drummers believe this affects the internal acoustics of the smaller drums. Maybe it does or maybe it's just a matter of personal preference. However, thinner shell drums are more likely to be affected by such a mount than thicker shell drums. In my opinion, you should try the DW brackets mounted onto the shell first......since you already have them. If that modification just doesn't produce the results you want, then you could drill larger holes for a Pearl Export style tom arm.